A nearby planetary nebula shines like a huge golden eye in a new photo snapped by a telescope in Chile. 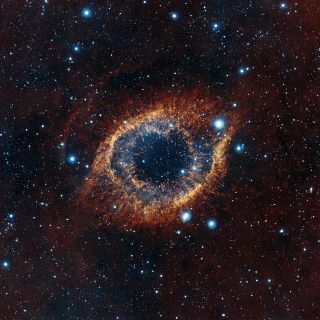 The image shows the Helix Nebula, which lies about 700 light-years from Earth in the constellation Aquarius (The Water Bearer). The picture was taken in infrared light by the European Southern Observatory's Vista telescope, one of the instruments at ESO's Paranal Observatory. Helix is a planetary nebula, a strange object that forms when a star like our sun exhausts its hydrogen fuel. The star's outer layers expand and cool, creating a huge envelope of dust and gas. Radiation flowing from the dying star ionizes this envelope, causing it to glow. The dying star at the heart of the Helix Nebula is evolving to become a white dwarf, a shrunken, super-dense object that can pack a sun's worth of material into a sphere the size of Earth. The star is visible as a tiny blue dot at the center of the picture, researchers said. The Helix Nebula is a complex object composed of dust, ionized material and molecular gas, arrayed in an intricate, flower-like pattern. The main ring of the Helix is about 2 light-years across, roughly equivalent to half the distance between our sun and its closest star. However, wispy material from the nebula spreads out at least 4 light-years into space from the central star, researchers said. These thin clouds of molecular gas are difficult to see in visible light, but Vista's infrared detectors can pick them out, and they show up in the new image as a dark red haze. This comparison shows a new view of the Helix Nebula acquired with the VISTA telescope in infrared light (left) and the more familiar view in visible light from the MPG/ESO 2.2-metre telescope (right). The infrared vision of VISTA reveals strands of cold nebular gas that are mostly obscured in visible light images of the Helix. Vista's keen eye also reveals fine structure in the planetary nebula’s rings, showing how cooler molecular gas is organized. The material clumps into filaments that radiate out from the center. While they may look tiny, these strands of molecular hydrogen — known as cometary knots — are each about the size of our solar system. The molecules that compose them can survive the powerful radiation emanating from the dying star precisely because they clump into these knots, which in turn are shielded by dust and molecular gas. It is currently unclear how the cometary knots may have formed, researchers said. The new Vista image also shows a wide array of stars and galaxies in the background, farther away than the Helix Nebula.